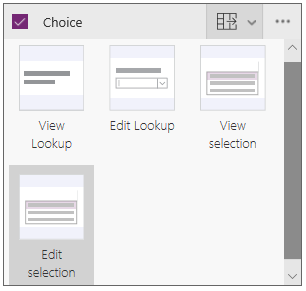 Hello everyone, today we released a PowerApps update with a few new features that we cooked up over the holidays. If you are working with a data source that does not support delegable queries, and performing a formula query on it such as search or filter, you were limited to working with only the first 500 records of the data set. Now that limit can optionally be increased to 2000 records! Note that this is an experimental feature for now that you can find in the PowerApps Experimental features section (File > App Settings > Experimental features). For more details, see Lance’s blog post. 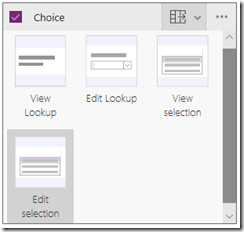 Combo box is replacing the old Lookup control as the default control of choice for single value lookup fields in SharePoint lists (note that Combo box is already being used for multi-value lookup fields). If you need to use the old Lookup control for consistency of your existing app, it is still available, together with its View and Edit cards, but note that with the new Combo box cards (called View selection and Edit selection) we are deprecating the use of Lookup control with the view to remove it some time in the future. We have also enhanced the Read mode of Combo box to allow you to see all items in a long list. Finally, the latest addition to our Office sample templates, Book a Room, shows you how to utilize the Office 365 connector to book rooms. For more details, see Casey’s blog post.